One of the greatest things about e-mail is that we can track how our recipients act upon our messages. Email tracking statistics – opens, clicks, and click-throughs – tell us whether our audience likes the email and what part of it they are mostly interested in. While open rate primarily depends on the email From and Subject, click and click-through rates are determined by your offer. It’s simple. If a recipient likes the offer, he clicks the link to get it. But… you must admit that people are now very careful to open unknown emails and click on strange links. The link looks normal and clearly shows at which page on which website it leads. ugly tracking links really decrease a click rate. For my test I used 3 versions of the email. They had the same From, Subject and the content. 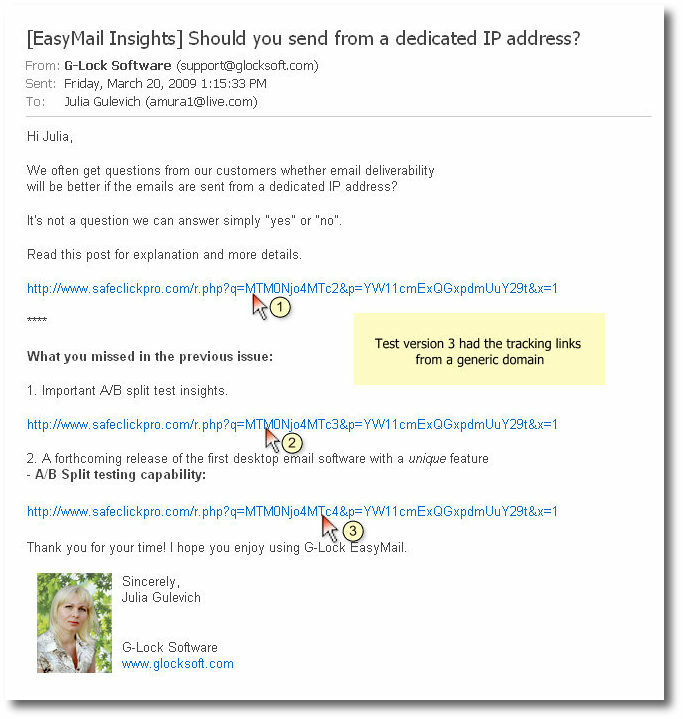 Test versions differed by one thing only – tracking links inside the email, more specifically, the way links are shown inside the email. 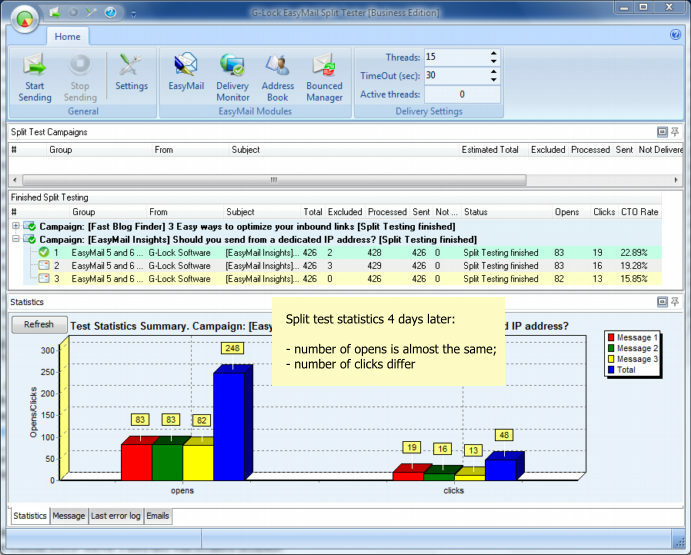 To conduct the split test, I used G-Lock EasyMail v6.50 which supported a split testing capability. Plus, I used G-Lock Analytics – email tracking service – to calculate email opens and link clicks. I sent 3 test versions to the equal quantity of recipients within the control group (30% of the whole list). Each test version was sent to 426 recipients. 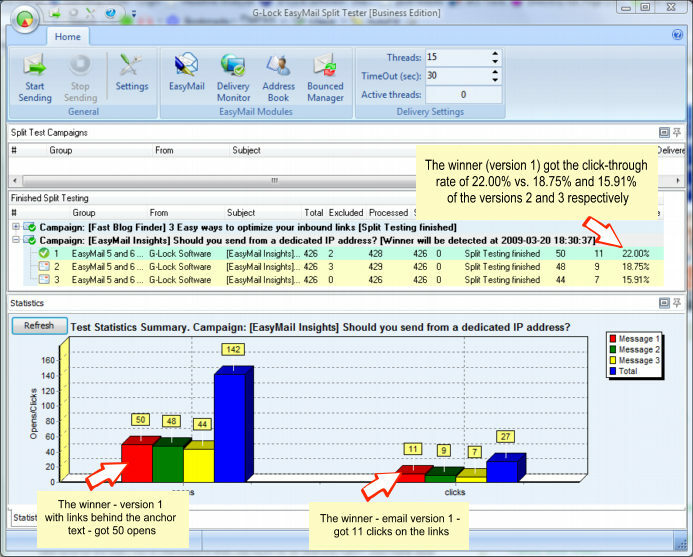 I set G-Lock EasyMail to determine the winner version by the number of clicks 4 hours later. This is reasonable because the goal of my case study was to determine the impact of the URL design on the click rate. You see the test version 1 with links from our domain hidden behind the anchor text was the current leader by opens and clicks. Now the number of opens for the version 1 and version 2 are the same, the version 3 is only one open behind. But the number of clicks differ. The version 1 with the tracking links from our domain which are hidden behind the anchor text was still the leader by clicks. The version 2 with full tracking links from our domain glocksoft.com took the 2nd place. And the version 3 including links from a generic domain was at the last place. The way you show the URLs in the email does matter and has impact on the click-through rate. People are more willing to click on clear and trustworthy links. A generic domain and a combination of generic characters are not the things that instill trust. They may be confusing for many people so they do not dare to click. If you think you could get a few additional clicks if you use friendly URLs, look at your tracking links, and contact your service or software provider to ask if there are any alternatives. If they give no alternatives, you tried at least. The value of tracking emails is worth a loss of several clicks. But if you can make your tracking links look attractive, don’t lose the chance. Each click counts. thanks for this post, its was nice to see your research and confim my opinions. As for the split testing, I think the test should have had an email where ‘anchor text’ is the same and the ‘url’ is different. What about the ugly non domain name links behind an anchor text. I dont think it matters if you have the ugliest tracking link behind anchor, because people don’t usually look at the url until they are already a few pages deep. In that case, the tracking link would haven fallen off. My grandma sends me these horrible forwards DAILY. About 10-15 a day. ONE of them was about paying careful attention to the url in your url bar. The thing is, even if you are entirely honest in your practices, but your url changes a LITTLE bit, THOSE peopel that got that email and over reacted will freak out and leave. Thats what makes shared SSL and things like that a little more risky. Nice test, “People are more willing to click on clear and trustworthy links. A generic domain and a combination of generic characters are not the things that instill trust” great conclusion . i’ll keep that in mind. Hello Julia, That was very interesting to me, as I am now building a list with some free software so thank you. I was thinking though that if you are sending out a plain text email and a html version at the same time to get clients who do not want any html, You would still have to give them a longer link minus tracking data? in the plain text version. Wanted to ask how your software affects the spam filters? do you have lot of emails sent to junk mail like some autoresponder tools have or? 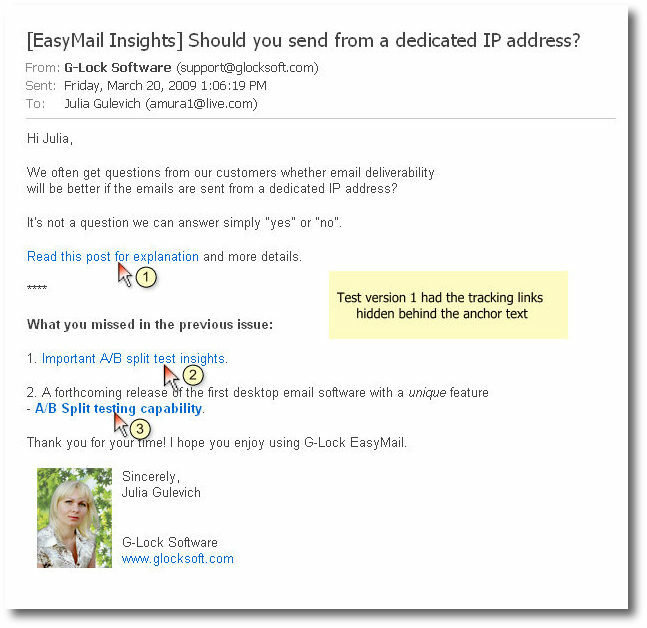 G-Lock EasyMail doesn’t affect spam filters in any way. 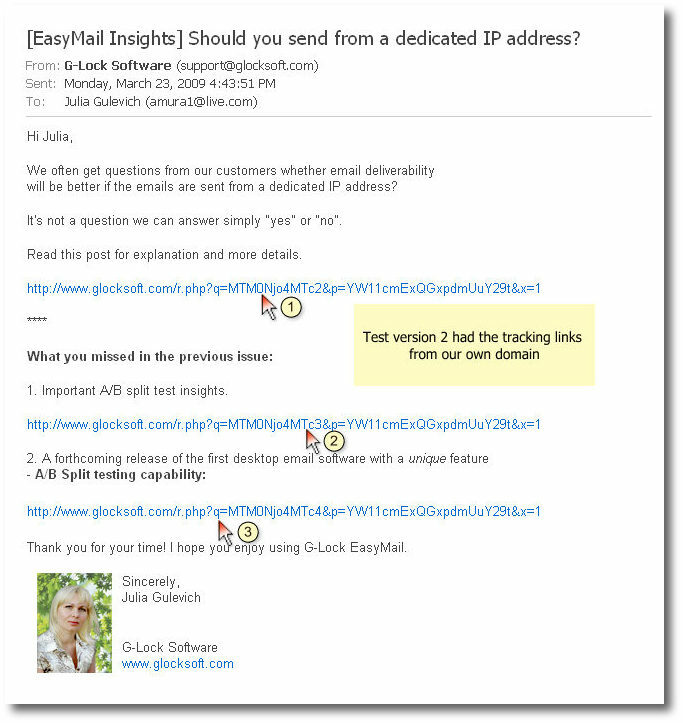 Whether your emails will be sent to a Junk email folder or to the Inbox depends on your IP address reputation and on the mail server you send emails from. It’s important that the mail server has the sender authentication records properly setup because many ISPs takes them into account when filtering emails. You can read articles on this website where I write about the sender authentication, about the shared and dedicated IP address, etc. That is great to know and thanks for showing us your testing results. I have always thought that a clean link would get better results. <a href="http://www.YourWebURL.com/my-great-offer? *a=c">www.glockeasymail.com Please let me know if you do a test using this. Interesting. I wonder if the rollover has any effect. In other words, I am assuming that the anchor text in Version 1 has the tracking links in Version 2 underneath (something that you can see when the mouse rolls over the link). Would the clickthrough rate have been different if the tracking links from Version 3 were used? Interesting piece of research – If anything I would have expected the anchor text link to have an even bigger percentage of the clicks. I’m not a statistics expert, but are those statistically significant differences between the percentages? Thanks for doing this test and sharing the results with us. I guess you would kind of expect that people would make clicking decisions based on appearance. To be honest I’m surprised the difference is so small. An interesting article though instinct lead me to guess what the results would be. This is a very useful piece of software you have here. I think I’ll be making a purchase as and when I set up my email marketing.